The Clumber estate formed part of Sherwood Forest until 1707 when licence was given to John Holles (Duke of Newcastle) of nearby Welbeck to enclose it as a park for the queen's use. Prior to the building of the first house at Clumber (see below) it is said that the park was a barren waste, boggy and untenanted except by rabbits. There may have been a hunting box on the estate, although this is not certain. The first house at Clumber was built by the Duke of Newcastle-under-Lyme in c.1760-70. Built of red brick, the architect was Stephen Wright. The Master Mason was Andrew Ince. The house comprised a large central block with four wings. In 1814 Benjamin Dean Wyatt submitted designs for alterations, followed in 1829 by a library and alterations by Sidney Smirke. In 1857 there were further designs for by Sir Charles Barry for extensive alterations and Italianate embellishments. Of these, only Smirke's designs were carried out. (Pevsner p100-101). In 1879 a disaterous fire destroyed almost all of Wright's creation. It is said too that the fire destroyed any evidence of the (possible) orginal hunting box mentioned above. A new house rose from the ashes. The central part of the house was rebuilt (1879-80), again in an Italianate style by Charles Barry the younger. 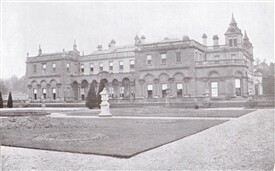 It was demolished in 1938, the surviving park and outbuildings now being administered by the National Trust. The sole surviving part of Barry's work of 1879-80 is the 'Duke's Study' near the lake, with bay windows flanked by pilasters. Whilst all traces of the Stephen Wright house of the 1770s have disappeared, features in the park from this period do survive. The large serpentine lake was created 1774-89, and beside it a Greek temple, and a three-arched stone bridge and cascade (1763). There is also a Roman Doric seat alcove and a grotto (1765-67), and a series of five gates by Wright. 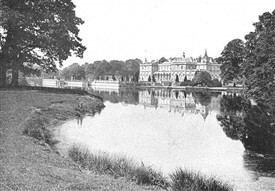 At the height of its extent, Guilford, writing in 1910, noted that Clumber park covered 3,400 acres and was eleven miles in circumference The great lake, he noted, covered 87 acres and had two vessels floating on it*.